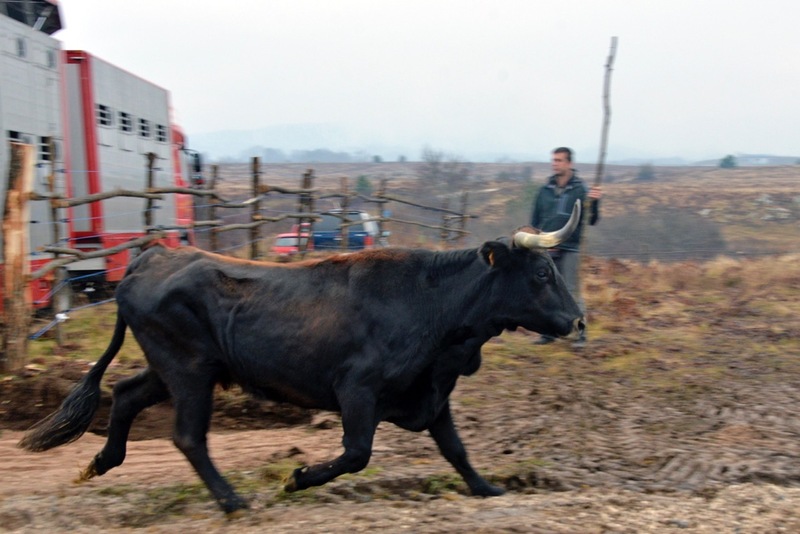 Only six days after the signature of a herd contract with two Croatian family farms, Rewilding Velebit brought in 22 Sayaguesa cattle from Spain to the vast abandoned plains in front of the Velebit Mountains. This means yet another breeding station for the Tauros Programme, which will greatly strengthen its effect. The magnificent animals, coming from Villar del Buey in Spain, were today brought to the Velebit rewilding area, becoming the first animals in this new Tauros breeding centre in the Lika plains. The truck arrived very early in the morning and was met by the new herd managers from the family farms OPG Vukelic and OPG Brkljacic, together with the Rewilding Velebit team and Ronald Goderie from the Taurus Foundation, who travelled to Croatia in order to be present at this milestone event. The Sayaguesa cattle herd is arriving to Velebit. – “It has been a great day and an important step towards the rewilding of Velebit”, says Davor Krmpotic, team leader of the Rewilding Velebit team. “Large herbivores play a key role in the immense biodiversity of this beautiful area. The Tauros Programme – an initiative of Rewilding Europe and the Taurus Foundation together – is now unwrapping in a very positive direction in Velebit”. – “The main idea of the Tauros Programme is to back-breed these animals into again becoming a fully self-sufficient, wild-living cattle species, that genetically comes as close as ever possible to the original aurochs”, explains Ronald Goderie from the Taurus Foundation. After the long transport, the animals were kept resting in the truck while waiting for the morning light. As soon as they then stepped out of the truck, they started grazing in the field and seemed like they immediately became a natural part of the Lika plains ecosystem. Given the often harsh winters in this area, it was decided that the herd will first be kept for several months within a recently constructed, quite large fenced area, in order for the animals to have time to adapt to the new environment. The release is foreseen to take place by the end of the winter, where the animals then will be grazing on 140 hectares of grassland together with a herd of Konik horses, which are soon also expected to arrive to the area, as a part of the Wild Horse Rewilding Programme. The Sayaguesa breed originates from the Spanish province of Zamora and it has preserved a number of genetic traits from the aurochs that make it very useful for back-breeding. 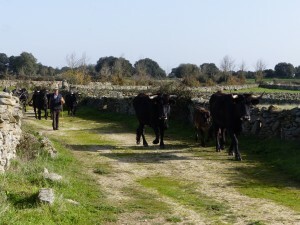 It is one of the original, ancient cattle breeds that DNA-wise stands the closest to the aurochs. 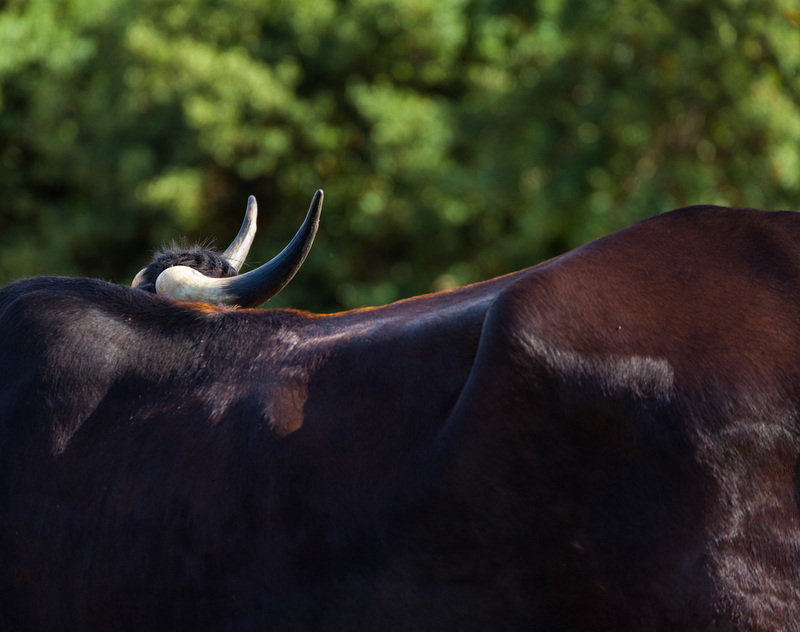 Sayaguesa bulls are large, weighing around a ton, long-legged and black in colour. They have many shared characteristics with the ancestor of all cattle, the aurochs. Their horns are aurochs-like and swung forwards, and they have the typical white-coloured muzzle of the aurochs, a yellowish eel-stripe along their spine and a swung, athletic backline which again resembles that of the aurochs. Furthermore, Sayaguesas don’t have the short, calf-like face of many domestic cattle breeds. In regard to their ecological adaptation to the wild and their behaviour, this breed is known to be hardy, robust and frugal and therefore needs neither shelters nor barns, they are simply used to live in the great outdoors all year round. The Sayaguesa herd in Velebit. Very shortly after transporting two Sayaguesa bulls to the Tauros breeding herd in Malo Libinje on the other side of the Velebit mountains in the midst of October, Rewilding Velebit secured this new large breeding site for the Tauros Programme. The aim is to enlarge this “Starter herd” of 20 adults and two calves, to at least 50 animals by the end of 2019. The main idea behind the Tauros Programme, in all the rewilding areas, is to bring back and preserve biodiversity in Europe, through bringing back a functional, wild version of the extinct aurochs, which was an absolute keystone species in many European ecosystems. Through selective breeding or back-breeding, the Tauros animals are expected to around the year 2025, again have the right, fully natural characteristics of the aurochs and to by then be officially recognized as a normal wildlife species. The final goal of the Tauros programme is the presence of the Tauros as a self-sufficient wild bovine grazer in herds of at least 150 animals each, in several of the rewilding areas in Europe, including the Velebit Mountains. Read more here about the Tauros Programme.